Question 1 How woollen clothes keep us warm during cold winter days? Question 2 Why wearing more layers of clothing during winter keeps us warmer than wearing just one thick piece of clothing? Question 3 Explain how the water in a beaker gets heated when a burner is kept below it? Question 4 Explain how the air in a room gets heated when a room heater kept on a floor in a corner of the room is switched on? Question 5 Explain how the blowing of sea breeze and land breeze take place in coastal areas ? Question 6 Why do people prefer to wear white clothes in summers? Question 7 Why is it better to wear dark clothes in winter? Question 8 Why is the box of a solar cooker painted black from inside? Question 9 It is advised that the outer walls of houses should be painted white in places with hot climate?Explain? Question 10 What is meant by convection?Explain with the help of an example? Question 11 Define radiation? What are infra-red radiations? Question 12 Why the Sun’s heat not reach earth by conduction or convection? Question 13 What are good conductors of heat? Give examples? Question 14 What are bad conductors of heat? give examples? Question 15 Why is a frying pan made of metal but the handle is made pf plastic or wood? Question 16 Define the term conduction? Question 17 Name the three ways in which heat can flow? Question 18 Why stainless steel frying pans are provided with copper bottoms? Question 19 Define the term convection currents? To carry heat from one part of an object to its other part, or from one object to another object is called transfer of heat. 1) If we dip a steel spoon in a cup of hot tea, we find that the temperature of spoon rises and it becomes hot. Some of the heat contained in hot tea has been transferred to spoon which is placed in it. Heat moves from hot tea to the cold spoon. 2) A utensil becomes hot when kept on the flame of a gas burner of the stove.This is because heat from the hot flame is transferred to the cold utensil. And when a hot utensil is removed from the gas burner, it cools down slowly. Heat flows from a hot object to a cold object. Heat flows from an object at higher temperature to another object at lower temperature. The flow of heat (or transfer of heat) stops when the two objects attain the same temperature. For example: If an iron ball at a temperature of 40°C is dropped into a bucket containing water at the same temperature of 40 °C, then heat will not flow either from iron ball to water or from water to iron ball (because both, the iron ball and water, are at the same temperature of 40°C). In solids, heat is transferred by conduction. In liquids and gases, heat is transferred by convection. And in empty space or vacuum (having no medium like solid, liquid or gas), heat is transferred by radiation. If we heat one end of a metal spoon by keeping it over a gas burner, we find that its other end also becomes hot after a while. Heat is transferred from the hot end of the metal spoon to its cold end. A transfer of heat from the hot part of a material to its colder part (without the movement of material as a whole) is called conduction. The transfer of heat by conduction takes place within the same object. 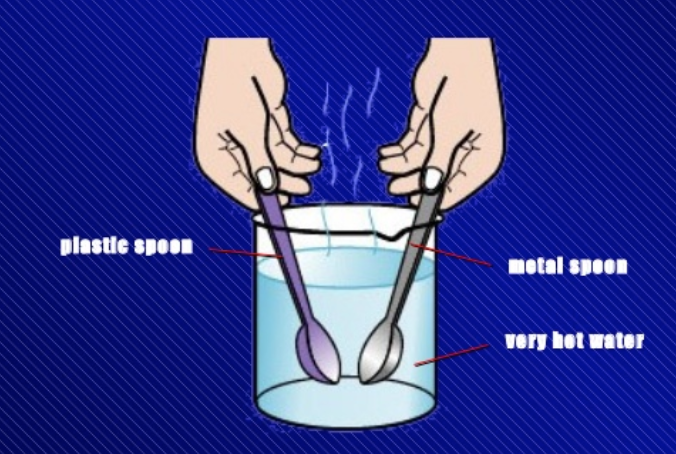 If we bring the hot end of the spoon in contact with the cold end of another spoon by touching them with each other, we will find that some of the heat of the hot spoon is transferred to the cold spoon due to which the cold spoon also becomes somewhat hot. Conduction is the transfer of heat from the hotter part of a material to its colder part without the movement of material as a whole. Examples of transfer of heat by conduction from our everyday life. 1) A cold metal spoon dipped in a hot cup of tea gets heated by conduction. 2) A frying pan kept on a gas stove transfers the heat of gas burner through its metal bottom by the process of conduction. We take a flat aluminium rod and fix some small iron nails on it with the help of wax. This rod along with its iron nails) is clamped to a stand. Let us heat the free end (left end) of the aluminium rod by keeping a burner below it. We will see that the iron nails attached to aluminium rod with wax start falling one by one. The nail attached nearest to the heated end of rod falls down first. And then the next ones fall. But the nail attached to the clamped end of the rod drops last of all. which holds the nails. Due to this the nails fall down one by one. Heat is transferred from the hot end of aluminium rod to its colder end by the process of conduction. In solids, the particles are closely packed together. During conduction, heat is transferred from particle to particle by means of back and forth vibrations of the particles (caused by the heat energy). The particles of a solid remain at their fixed positions. There is no actual movement of the particles of the solid from its hotter end to the colder end during the conduction of heat through it. Good conductors of heat are called conductors of heat. Poor conductors of heat are also called insulators (of heat). the beaker containing hot water. After about two minutes, we touch the top ends of both the spoons with our hand, one by one. We will find that the top end of metal spoon feels quite hot but the top end of plastic spoon does not feel hot. This is because heat from the hot water flows easily through the metal spoon and reaches its other end. But the heat does not flow easily through the plastic spoon due to which its other end remains almost cold. This activity tells us that metal spoon is a good conductor of heat whereas plastic spoon is a poor conductor of heat. Plastic is an insulator of heat. Those materials which allow heat to pass through them easily are called good conductors of heat. All the metals are good conductors of heat. For example: The metals such as silver, copper, aluminium, iron and mercury are all good conductors of heat. Silver metal is the best conductor of heat. Copper is one of the best conductors of heat. Aluminium is also a very good conductor of heat. Metal alloys (such as brass, steel and stainless steel) are also good conductors of heat. Copper is a much better conductor of heat than stainless steel. All the objects made of metals and metal alloys are also good conductors of heat. Since metals and their alloys are good conductors of heat, therefore if one end of an object made of metal (or metal alloy) is heated, then its other end becomes hot very quickly. Those materials which do not allow heat to pass through them easily are called poor conductors of heat. The materials which are poor conductors of heat are called insulators. Examples of poor conductors of heat (or insulators of heat) are : plastic, paper, cloth, leather, cotton, wool, thermocol, rubber, asbestos, clay, bricks, cork, cane, bamboo straw, saw-dust, glass, fibreglass, water and air. Water is a poor conductor of heat and air is a very poor conductor of heat. Air is a very good insulator of heat. The materials which trap air (such as cotton, wool, fur, feathers, fibreglass and plastic foam) are very poor conductors of heat. Materials having trapped air in them are excellent insulators of heat. If one end of an object is made of insulator material is heated, then its other end does not become hot.It either remains almost cold or becomes only slightly hot. Good conductors are used to carry heat quickly where it is wanted. Insulators are used to stop heat from going where it is not wanted. The cooking utensils are made of metals (or metal alloys). This is because metals (and metal alloys) are good conductors of heat which transfer the heat from the gas stove quickly to the food placed inside the utensils. The cooking utensils are provided with handles made of plastic (or wood). This is because plastic (or wood) is a poor conductor of heat. A plastic (or wooden) handle prevents the heat from hot cooking utensil reaching our hand so that we can lift the hot cooking utensil safely from its handle. For example: A frying pan is made of aluminium metal or stainless steel because aluminium metal and stainless steel are good conductors of heat which conduct the heat from gas burner of stove quickly through their bottom to the food kept inside. Some stainless steel frying pans are provided with copper bottoms. Copper metal is a much better conductor of heat than stainless steel (due to which it can transfer the heat of gas stove burner to the food kept inside much more quickly). Mercury metal is used in making thermometers because it is a good conductor of heat. The handle of a soldering iron is made of wood (or plastic) because wood (or plastic) is a poor conductor of heat.The wooden (or plastic) handle does not conduct the heat of hot soldering iron to our hand so that we can hold the hot soldering iron safely from its handle. An electric iron is also provided with a plastic handle so that when electric iron gets hot, its plastic handle (being a poor conductor of heat) remains cold and can be held safely with our hand. Table mats are usually made of poor conductors (or insulators) such as plastic or cork to protect the table tops from hot dishes. Why we Wear Woollen Clothes in Winter ? Woollen clothes keep us warm during cold winter days. Wool is a poor conductor of heat due to which woollen clothes stop the flow of heat from our warm body to the cold surroundings. There is air trapped in-between the fibres of the woollen clothes. Air is a very poor conductor of heat. So, the air trapped in fibres of woollen clothes also stops the flow of heat from our warm body to the cold surroundings. Since our body does not lose its heat, we feel warm on wearing woollen clothes in winter. We should prefer two thin woollen blankets joined together. This is because the two thin woollen blankets joined together will have a layer of air trapped in-between them. And this extra layer of trapped air (being a very poor conductor of heat) will prevent our body heat from going away to the cold air more efficiently and hence keep us more warm. The single, thick woollen blanket does not have this extra layer of air in it. Wearing more layers of clothes keeps us warmer in winter than wearing just one thick piece of clothing. This is because more layers of clothes trap more air in them and air being a very poor conductor of heat, prevents our body heat from going away to cold surroundings. The feathers of birds keep them warm in cold weather due to air trapped in them. Air being a poor conductor of heat, prevents the body heat of birds from escaping to the cold surroundings and hence keeps the birds warm in cold weather. The animals having fur (such as polar bear) keep warm in cold weather because their fur traps a lot of air. It is now possible to construct houses (and other buildings) in such a way that they are not affected much by the heat or cold outside. This can be done by constructing the outer walls of houses (or other buildings) by using hollow bricks (which contain trapped air). Since the hollow bricks contain a very poor conductor of heat ‘air’ trapped in them, the walls made of hollow bricks will neither allow outside heat to come in during summer nor allow inside heat to go out during winter. This will save a lot of electrical energy as well as other fuels. During winter season, a metal object kept in a room feels very cold to touch but a wooden object in the same room feels warmer to touch. Reason : Metal object is a good conductor of heat. So, when we touch the metal object, it conducts away heat from our hand quickly. And by losing heat, our hand feels cold. On the other hand, the wooden object (being a poor conductor of heat) does not allow the heat of our hand to escape and hence feels warmer to touch. Convection is the transfer of heat from the hotter parts of a liquid (or gas) to its colder parts by the movement of the liquid (or gas) itself. The transfer of heat by convection can take place only in liquids and gases because the particles in liquids and gases can move about freely. In convection, the particles of a liquid (or gas) actually move from the hotter regions to the colder regions to transfer heat. The transfer of heat by convection cannot take place in solids because the particles in the solids are fixed at a place and hence cannot move about freely. The transfer of heat by convection also cannot take place in empty space (called vacuum) because there are no particles of any kind in empty space which can move and transfer heat. Water transfers heat by process of convection. In order to heat water, we keep the vessel containing water over a gas burner. Though the burner is kept at the bottom of the vessel, but it still heats all the water in the vessel. downwards. This process of hot water rising upwards and cold water sinking downwards takes place again and again due to which the whole water in the beaker gets heated uniformly. The circulatory movements of water in the beaker in which hot water rises and cold water sinks again and again, are called convection currents. These convection currents transfer heat from water at the bottom of the beaker to the top of beaker rapidly. movement of this hot water (which has been coloured purple by dissolved potassium permanganate crystal). We will see the purple streaks of hot water rise from the bottom of flask up to the surface of water and then sink downward near the walls of the flask. These purple coloured streaks seen in the water of flask (which is being heated from below) show the convection currents taking place in the water of flask which transfer heat from the bottom to the top. The heating element of an electric kettle (used for boiling water to make tea) is also fixed at the bottom of the kettle. If the water taken in a vessel is heated by a burner at the top, then the hot water (being lighter) stays at the top of the vessel. Since no hot water from top can sink downwards towards the bottom of the vessel, the water at the bottom of such a vessel (which is being heated at the top) will remain cold. Air is a very poor conductor of heat. It transfers heat from its hotter parts to colder parts by the process of convection (by moving itself). In order to heat air in a room during winter, we keep the heater on the floor (usually in a corner of the room).Though the heater is placed on the floor at the bottom of the room but it still heats all the air in the room. When air is heated by the heater in one part of the room, it transfers heat by convection. heated uniformly after some time. A room heater heats all the air in a room by setting up convection currents in the air. Gentle wind is called breeze. The people living in coastal areas (sea-side areas) experience interesting phenomenon called sea-breeze and land-breeze which are based on the transfer of heat in air by convection currents. During day time, when the sun shines, the solid land gets heated to a higher temperature much more quickly than liquid sea-water. The hot air over the land rises upwards and cooler air from over the sea moves towards the land in the form of a cool breeze. The breeze blowing from the sea towards the land is called sea-breeze. The cool sea-breeze blows only during the day time when the land is hotter than the sea. To receive the cool sea-breeze during the day, the windows of houses in coastal areas are-made to face the sea. At night time, the hot land cools much faster than the warm sea-water. Due to this, the land becomes cool very quickly but the sea-water remains warm for a much longer time. So, during night, the hot air over the warm sea rises upwards and cooler air from the land blows in towards the sea in the form of a breeze (to take the place of hot rising air) (see Figure 16). The breeze blowing from the land towards the sea is called land-breeze. Land breeze blows only during the night when the sea-water is hotter than the land. When we switch on an electric bulb, it becomes hot and gives out heat and light. Now, if we keep our hand a short distance below the glowing bulb, we can feel its heat on the hand.This means that the hot, glowing bulb is transferring some of its heat to our hand held below it. The hot electric bulb cannot transfer its heat to our hand by conduction because air is a poor conductor of heat. The hot bulb also cannot transfer its heat to our hand by convection because the convection currents of air always carry heat in the upward direction (but our hand is held below the bulb). The hot electric bulb transfers its heat to our hand held below it by the process called radiation. All the hot objects can transfer heat by radiation. means of heat rays. Method of transfer of heat energy by heat rays is called radiation.Heat can be transferred from a hot body to a cold body by radiation even if there is no material medium (like solid, liquid or as) between them. Radiation is the transfer of heat energy from a hot body to a cold body by means of heat rays, without any material medium between them. Example of radiation is the transfer of heat energy of the sun to the earth. When we come out in the sunshine, we feel hot. This means that the heat from the sun is being transferred to us which makes us feel hot. The sun is very far away from the earth and there is mainly empty space (vacuum) between the sun and the earth. Heat from the sun cannot reach the earth by conduction or convection because both these processes require a material medium (like solid, liquid or gas) to transfer heat, they cannot take place in empty space (or vacuum). Heat from the sun reaches on the earth by the process of radiation. The sun is an extremely hot object. The sun emits heat radiations (or heat rays) in all directions. These heat radiations travel through vacuum between the sun and the earth at a very high speed and reach us on the earth. When the sun’s radiations fall on the earth and its objects, they receive heat energy and hence get heated. The invisible heat rays which transfer heat by radiation are called infra-red rays. In our day to day life we have many situations where heat is transferred by radiation through a medium called air. 1) When we stand next to a burning fire, we can feel the heat of the fire falling on our face. The heat is transferred from the fire to our face by the process of radiation. 2) When we sit in front of a room-heater, we get heat directly by the process of radiation. 3) A hot utensil kept away from the flame cools down by transferring its heat to the surroundings by radiation. 4) Depending on the temperature of surroundings, our body too gives heat to the surroundings or receives heat from the surroundings by radiation. The amount of heat which an object can absorb by radiation depends on the colour of the object. The objects having dark colours absorb more heat radiations than the objects having light colours. We take a black painted tin can and a white tin can of the same size and place them separately. Pour equal amounts of water in both the tin cans and fix thermometers.The initial temperatures of water in both the tin cans are noted. We place both the tin cans in bright sunshine for one hour. The heat radiations of sun will fall equally on both the tin cans. After one hour, we note down the temperatures of water in both the tin cans again. We will find that water in black tin can is at a higher temperature than in white tin can. Since the temperature of water in black tin can is higher, it shows that the black coloured tin can has absorbed more heat of the sun and the lower temperature of water in the white tin can shows that the white coloured tin can absorbs less heat from the sun. A black object absorbs more heat radiations than a white object. Since a black object is a good absorber of heat radiations, it also means that a black object is a bad reflector of heat radiations. Since a white object is a poor absorber of heat radiations, it means that a white object is a good reflector of heat radiations. The amount of heat which a hot object can emit (give out) by radiation also depends on the colour of the object. The hot objects having dark colours emit more heat radiations than the hot objects having light colours. The objects having dark colours are better emitters of heat than objects having light colour on their surfaces. We take a black tin can and a white tin can of the same size. These tin cans are placed on wooden blocks separately and kept in a shady place inside a room . Both the tin cans are filled with the same hot water. We note the initial temperatures of hot water in both the tin cans. Their initial temperatures are exactly equal. Allow both the tin cans to stand for ten minutes. After ten minutes, note the temperatures of water in both the tin cans again. We will find that the water in black tin can is at a lower temperature than the water in white tin can. This means that the black coloured tin can has lost heat faster than the white coloured tin can, Thus, a black object is a better emitter of heat. On the other hand, the higher temperature of water in white tin can shows that the white coloured tin can has lost heat slowly. Thus, a white object is a poor emitter of heat. Dark coloured objects absorb heat better and also emit heat better than light coloured objects. Dark coloured objects are poor reflectors of heat but light coloured objects are good reflectors of heat. We use dark coloured objects where we want to absorb more heat and light coloured objects where less heat is desired. 1) Colour of Clothes: People prefer to wear white clothes (or light coloured clothes) in the hot summer days because white clothes (or light coloured clothes) absorb less heat from the sun. White clothes (or light coloured clothes) reflect most of the sun’s heat rays which fall on them and keep us cool and comfortable in hot weather. People prefer to wear dark coloured clothes in the cold winter days. This is because dark coloured clothes absorb more heat rays from the sun and keep us warm in winter season. 2) Colour of Houses: The houses in hot, sunny countries are usually painted white or with light colours from outside. This is because a house painted white or with light colours absorbs very little sun’s heat rays, it reflects most of the sun’s heat rays. This keeps the house cool in the hot days of summer. 3) Solar Cooker (and Solar Water Heater): The box of solar cooker (and solar water heater) is painted black from inside. This is because a black surface is a very good absorber of heat and it will absorb maximum heat radiations coming from the sun.